So anyway, here’s the info. The march will begin in Ain Mreisseh, in front of the Abdel Nasser statue at 11AM on Sunday morning, proceeding from there (presumably downtown). The campaign has a Facebook group page, a Facebook event page, a Twitter page, a blog, and a mailing list (email the subject heading “subscribe” to leblaique@gmail.com). There’s also a graffiti campaign planned (including a Maya Zankoul creation designed for the Qifa Nabki blog, to be unveiled somewhere on Bliss Street), and demonstrations planned at Lebanese embassies and consulates worldwide. So get out there and make your voices heard! For new readers who are interested in what all of this secularism business is, you can read up on the issue here, here, here, here, here, and here. 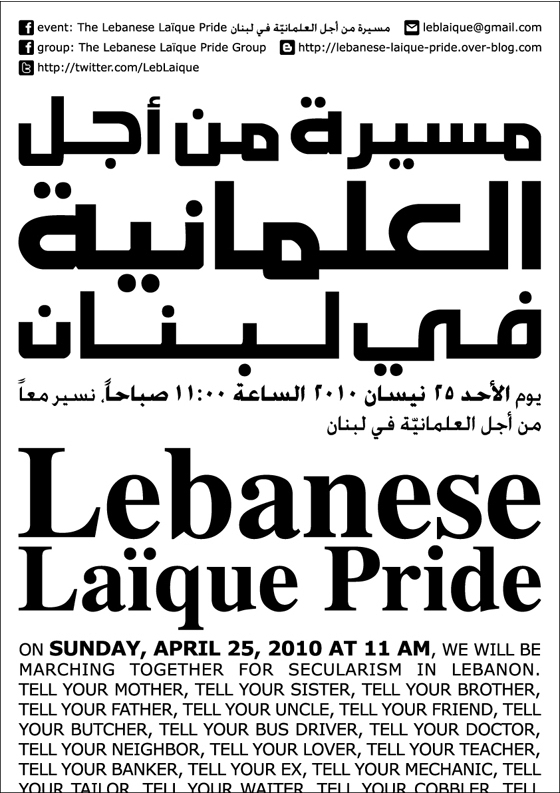 What is secularism in a Lebanese context? Is it desirable and can it be applied? Is this just a way for you people who are going down to feel like you are modern & progressive? It is irresponsible to call for secularism in Lebanon people our society is ready for such a thing. Otherwise, it will just lead to another civil conflict. I say enjoying a Sunday afternoon brunch is time better spent.